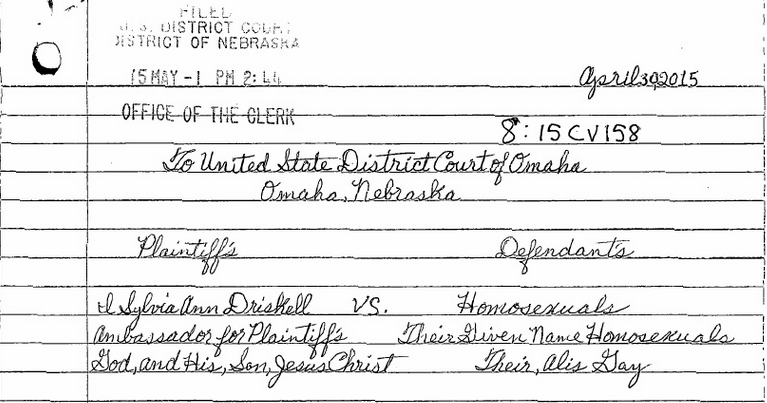 Driskell v. Homosexuals: Nebraska woman sues every gay person on the planet. Driskell v. Homosexuals: the case of the century? Technically, Driskell v. Homosexuals is a bit more complex than that. Driskell isn’t suing “the Homosexuals” on her own behalf; rather, she is “an Ambassador for Plaintiffs God, and His, Son, Jesus Christ” (sic). According to Driskell, God and Jesus want the U.S. District Court for the District of Nebraska to hold a trial to determine “Is Homosexuality a sin, or not a sin” (sic). Driskell, who is 60, cites several Bible verses—as well as Webster’s Dictionary—to prove homosexuality is, indeed, a sin. And she demands that gay people appear in federal court to prove “that its not a sin to be homosexual” (sic). The stakes, she says, are as high as they can be: “The way to destroy any Nation, or State is to destroy its morals, Look what happen to Sodom and Gomorrah” (sic).